I have to confess that I have a fondness for camera bags. Much like cameras, I like to have a variety of bags from which to choose to fit the situation, whether it be to carry several cameras and lenses or if I'm venturing out on a day trip. My latest bag is the Lowepro Passport Sling III. There are a lot of things to like about the bag and just a couple of things that I might change. It's a smaller bag but not tiny. It's about 14 inches wide and stands about 8 inches high. When packed, it's about 7 inches deep from front to back. The wide shoulder strap is adjustable and has a nice padded sleeve, which can be removed. As the name indicates, it's a "sling" bag – a popular style that is part backpack and part shoulder bag but more comfortable than a shoulder bag and more secure than both. With a shoulder bag, you sometimes lift that shoulder to prevent it from sliding away. With a sling bag, you can walk upright, just like your fellow homo sapiens. If you're in a hurry, you can still carry it on your shoulder. Because it is a sling bag, it's easy to slide it to the front when you need to keep an eye on your things, such as if you're in a crowded area or on public transportation. The bag retails for US$59.99. I bought mine just before Christmas at Best Buy. 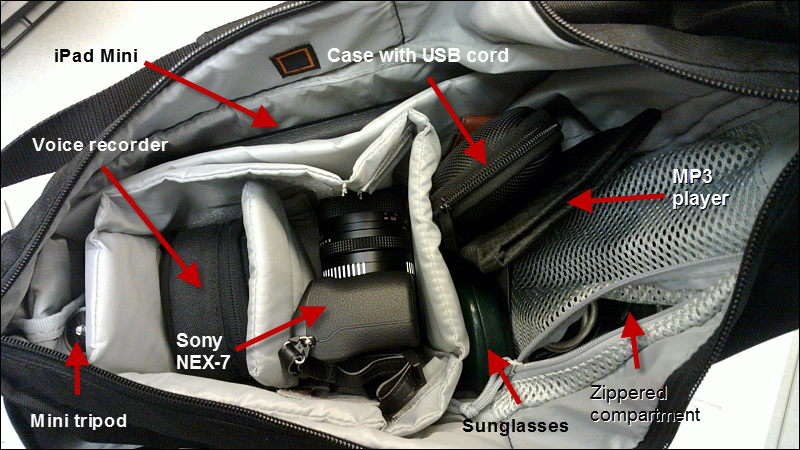 The Passport Sling III has a couple of nice features. It has a removable inner pouch that is divided into two compartments by way of a removable divider. I'd like to see denser padding on the bottom and stiffer walls on the pouch. Inside the bag near the tented end is a small zippered mesh compartment with a strapped clasp to which you can attach your keys. It's also good place to store a couple of rolls of film, batteries, a memory card and possibly your wallet. There also is an inner non-removable padded sleeve that can hold a tablet device. The outside of the bag has one pouch on the end to hold a few items, and two slim pockets for printed material, such as tickets or cash. On the opposite end of the bag is a zipper that lets you enlarge the storage space in the "tent" area. You can see the zipper on the left side in the photo at the top. With the inner pouch in place, I have room on either end to hold a few more things. I usually carry in it a pair of sunglasses, some reading glasses, a zipper case that holds a USB cord and SD memory card and my MP3 player and earphones. If you're heading out for a day trip, this is a great bag to take along. I can fit an SLR with a 50mm lens, plus a second lens. Or a twin-lens reflex camera and a light meter. Or a Sony NEX-7 with its kit lens and another lens. It's pretty much open to you as to what you decide to pack. The padded sleeve comfortably holds an iPad Mini or a larger Android 10-inch tablet. I don't believe it's wide enough to hold a netbook-type computer. 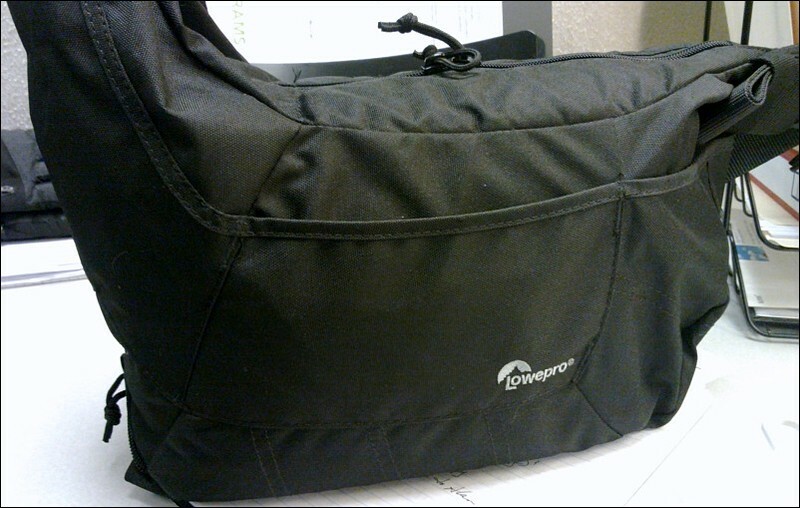 The shoulder strap, which is suitably wide, can be adjusted easily, and Lowepro provided a place to tuck the excess strap. I wish that it had a handle for those times when I just want to grab it quickly. The padded sleeve is movable so you can adjust the bag and still keep it comfortably on your shoulder. The quality of construction and choice of materials is very good, as you would expect from Lowepro. The bag is available in either black or mica (slate gray). Hi Mike, Thanks for this very good and interesting review. Especially the picture of the inside of the bag is interesting for me as a potential buyer. Last year I had been thinking of buying the former version of this bag but went for the smaller ThinkTank shoulder bag. Recently I noticed that LowePro indeed had this new model III out. I think it is a very handy sort of bag, as you said, and I think I may still buy one soon, as I like the idea of 'slinging' the bag forward to take the camera out. Thanks! One of the things that I like is that it keeps me from overpacking. I've been using a Tenba Messenger, and it became ridiculous how many things I was able to fit into the bag. The voice recorder is for some voiceover work that I'm doing and plan to do. The mini tripod is for the voice recorder. The small black circular zippered case is sold on Amazon (and now at Radio Shack). They are great for holding filters, cables, extra batteries, earphones or other small items. I bought this bag from Amazon and it arrived last week. I must say that it meets my expectations entirely and that all the gear that I would want to carry with me fits in it perfectly. It is also very comfortable, light and versatile to carry. For this low price it may very well turn out to be my favorite camera bag! I'm looking forward to using it 'on the field'.